Nutmeg and Barley (13 pp) and Cork and Fuzz (14 pp) all in the same 48-page immediate download! Sharable within your school! Only $12.95! Frog says "Hi" and introduces himself to fly. Fly says, "Nice to meet you." Frog asks, "Nice to eat you." Guess what happens next? That was just the first of five funny stories about Frog and Fly. It takes just a few wordsand some simple pictures to make each funny story. In Frog and Fly by Jeff Mack, kids will love their first experience with an easy chapter book. 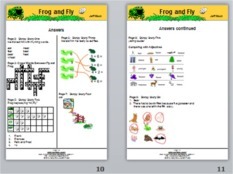 For an introduction to food chains and life cycles, Frog and Fly provides a great anticipatory set! Life Cycle: What Do Frogs Eat and What Eats Frogs? 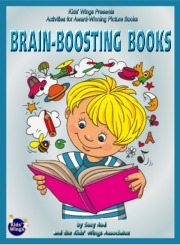 A 10-page literature guide, perfect for lesson plans, handouts, or projection on your electronic board for Frog and Fly by Jeff Mack is part of the 2013 Literature Collection, Brain Boosting Books! Slurpy Story 6: Comprehension Question and Which Character Was Not in the Story? Buy Frog and Fly by Jeff Mack NOW! YoYour purchases through the Kids Wings and Amazon Links help to keep our website doors open!